The aim of this chapter is to study fully fuzzy linear fractional programming (FFLFP) problems where all coefficients of the decision variables and parameters are characterized by triangular fuzzy numbers. To deal with this, the authors have first to transform FFLFP problems to fuzzy linear programming (FLP) problems by using Charnes and Cooper method and then use signed distance ranking to convert fuzzy linear programming (FLP) problems to crisp linear programming (LP) problems. The proposed method is solved by using the simplex method to find the optimal solution of the problem. The authors have studied sensitivity analysis to determine changes in the optimal solution of the fully fuzzy linear fractional programming (FFLFP) problems resulting from changes in the parameters. To demonstrate the proposed method, one numerical example is solved. Mathematical optimization is the process of -finding the conditions that give the maximum or the minimum value of a function. 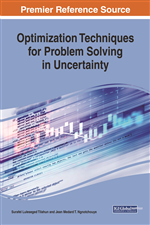 A number of methods have been developed for solving different types of optimization problems (Astolfi, 2006). where represents the vector of variables to be determined, and are vectors of (known) coefficients, is a (known) matrix of coefficients and are constants. The constraints have to restrict the feasible region to , i.e., the region on which the is positive. Zadeh (1965) introduced the notion of fuzzy sets to describe vagueness mathematically in its very abstractness and tried to solve such problems by giving a certain grade of membership to each member of a given set. Zadeh (1965) has defined a fuzzy set as a generalization of the characteristic function of a subset. A fuzzy set can be defined mathematically by assigning to each possible individual in the universe of discourse, a value representing its grade of membership in the fuzzy set. The membership grades are very often represented by real numbers in the closed interval between 0 and 1. The nearer the value of an element to unity, the higher the grade of its membership. For each , when , x is said to be a member of A; when , x is as a non-member of A.